With just a week to go before Apple's jumbo-sized iPhone 7 Plus hits the market, its chief competitor— Samsung's Galaxy Note 7— continues to deal with the fallout from faulty batteries, including a safety warning issued by the U.S. Federal Aviation Administration. "In light of recent incidents and concerns raised by Samsung about its Galaxy Note 7 devices, the Federal Aviation Administration strongly advises passengers not to turn on or charge these devices on board aircraft and not to stow them in any checked baggage," the FAA said in a public statement this week. Just a week ago, Samsung issued a global recall for its newly released phablet-style smartphone. 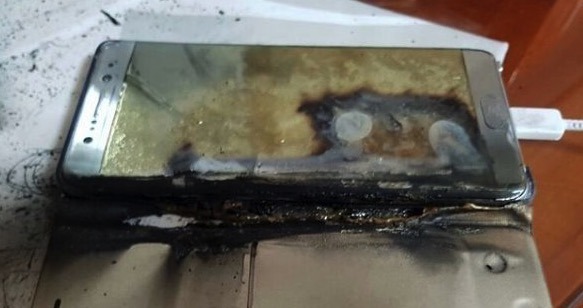 A handful of units have suffered from dangerous exploding batteries, with one alleged to have totaled a Jeep in Florida this week. In addition to the hazardous public relations issue, Samsung is also countering Apple's own phablet release— the iPhone 7 Plus, which is set to launch in one week, on Sept. 16. Samsung and Apple are the two largest smartphone makers in the world, and are fierce competitors. Apple's own public relations issue —the elimination of the headphone jack from the iPhone 7 series— is a decidedly less life threatening controversy than the global Galaxy Note 7 recall. Update: The U.S. Consumer Product Safety Commission on Friday issued a statement urging all Note 7 owners to turn off their device as Samsung works to announce an official recall, reports Reuters.